We are officially past the six month mark or our pregnancy and our nesting instincts are now in overdrive! We’ll be crafting together the babe’s nursery in November – but we’ve got quite the de-cluttering to do first. And for that reason I’m hosting a mega sale this week! Starting on Thursday, October 23rd through Monday, October 27th I’m cutting and slashing prices on many Pierogi Picnic designs throughout my Etsy shop. 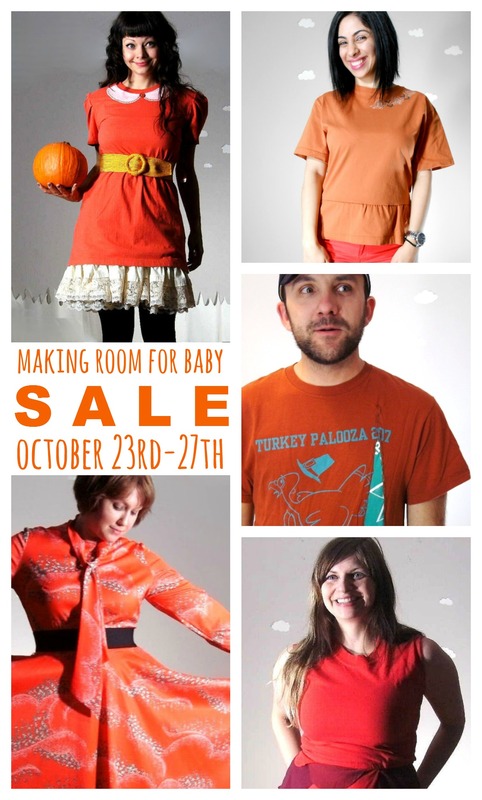 We’re calling it the “Making Room for Baby” sale! Catchy, isn’t it?! I’ll be putting many classic items on deep discount, as well as creating grab bags for retired designs. I’m also knocking dollars off newer creations and vintage – so if you’re starting your holiday shopping early – you won’t want to miss this! PLUS, help get the word out about the sale and I’ll send you a coupon for free shipping that you can use anytime between now and the end of the year. International buyers included! Simply share our status off the Pierogi Picnic Facebook page and I’ll private message you the code. Here’s to finding new forever homes for lots of my designs this weekend!